home of the Primary School, will show why ISZL is such an incredible place to learn. The Primary School is a thriving and connected learning community where children and families experience a sense of belonging, through friendship and the joy of working, playing and learning together. We value children as active learners who choose, plan, act and challenge themselves. This stimulates a climate of reciprocity that encourages listening to children, trust, communication and social interaction. 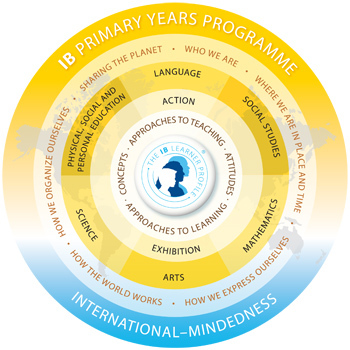 As an International Baccalaureate (IB) World School, our philosophies and teaching and learning programme are developed within the Primary Years Programme (PYP) framework. We recognise that collaboration between teachers, children and parents produce positive, productive relationships and we view parents as partners in their child’s education as we aim to create an atmosphere of community, collaboration and trust. We look forward to welcoming your child to the Primary School! At ISZL we believe academic learning and social and emotional development are inextricably intertwined. Our school promotes a climate of respect and views this as the responsibility of all community members. Staff recognise that every child is an individual and provide opportunities for children to explore and express themselves through multiple pathways. Our classrooms are filled with a learning culture of respect and trust and this is supported by the IB Learner Profile. ISZL is committed to a concept-driven curriculum as a means of supporting student-centered inquiry. This means that learning is explored within the context of relevant and engaging experiences. We believe that children learn in different ways and at different rates. Therefore, educators adjust their teaching approaches to meet the needs of all students and offer them an appropriate level of challenge. At the heart of any school are the people. Essential to a connected and caring community are teachers who believe teaching is a vocation. Their enthusiasm and passion for working with children is evident in the nurturing relationships and the respect shared between the children and their teachers. Creating a learning culture that fuels curiosity, creativity and an intrinsic motivation to learn ensures children love coming to school each day. This foundation sets them on the path to reaching their potential as a learner. Our international teachers are highly qualified and their specialist knowledge and experience informs how they plan learning for the diverse needs of children. With such a range of international teachers, multilingualism and a depth of cultural understanding is embedded into our school culture. Informed by current research and technological advances, teachers at ISZL demonstrate their commitment to lifelong learning by actively participating in ongoing professional development. This learning is focused on improving student learning and strengthening every area of school life. In Grades 3, 4 and 5, students participate in Personal Development Week. These week-long events take place in a variety of locations around Switzerland and the students participate in a range of exciting educational and outdoor activities, as well as having the opportunity to bond with their peers and teachers. Experiences outside the classroom help encourage students’ sense of involvement and wellbeing. A wide range of sports, clubs and activities are offered to children after school. We also provide instrument lessons, language classes, and a dance and football school on campus. During school holidays there are a variety of holiday camps made available to students which are staffed by our teachers. At ISZL we aim to support student diversity and we recognise that students learn differently. We understand the need for personalised learning to meet the needs of all learners therefore Student Services offers a comprehensive learning support team who plan differentiated learning for students. EAL (English as an Additional Language) teachers, Learning Support teachers, school counsellors and school nurses work collaboratively with the each student’s teachers to support their individual academic, social/emotional, physical and health needs. Establishing open and productive partnerships between the child, parents and teachers is central to providing a holistic and comprehensive learning plan. We have well established links with specialist support services in the area including educational psychologists and behavioural therapists should families require such services. We foster an appreciation of diversity and international mindedness through our units of inquiry, through the diversity provided by our own international community and by creating links to the local Swiss community through German language and culture. Children in Grades One to Five have four German lessons per week with a German teacher. Our comprehensive ISZL First Language Programme offers students the opportunity to develop and maintain their first language skills. We believe that this is crucial for cognitive development, helps foster cultural identity and enables students to remain in touch with the language, literature, and culture of their family background. ISZL students participate in over 25 different after-school first language classes. We currently offer classes in Brazilian Portuguese, Danish, Dutch, French, Finnish, Greek, Hungarian, Italian, Mandarin Chinese, Portuguese, Spanish and Swedish. All our first language teachers are qualified teachers and are part of the First Language Team. At ISZL, English as an Additional Language (EAL) support is extra English language support for students in Kindergarten to Grade 10 who come from non-English speaking backgrounds or have been educated in a language other than English. In the Primary School, EAL students can receive English support from an EAL teacher in their classes (referred to as push-in support) and in the form of extra English lessons (referred to as pull-out support). We are proud to have a dedicated team of specialist EAL teachers who are at the forefront of international discussion on best practice for EAL students. Educational technology provides powerful possibilities for teaching and learning that are not otherwise possible. It is a dynamic and ever-changing field and one that ISZL is committed to embracing. In the Primary School, students use technology as a tool to further their learning. They are supported in this by their classroom teachers and a Technology Coach. In Grades Three to Five students use ‘Blogger’ as a platform for documenting their learning. This electronic portfolio remains with them as they continue to add to it from year to year, up to Grade Twelve. Teachers post regular communication for parents via Schoology, our virtual learning environment. Learn more about our Educational Technology programme. At ISZL we believe that spending time outdoors is good for children’s health and well-being and that direct experience of the natural world can motivate positive environmental action especially when supported by adults. In Grades Two to Five students engage in several Outdoor Learning sessions each day. We also recognise the value of first-hand experiences for learning and we aim to take advantage of the many opportunities available on our doorstep such as farm visits, museum visits and trips to local landmarks such as the Hollgrotten caves and Augusta Raurica. We take full advantage of our position on the edge of the forest at the foot of the Baarberg. Forest walks to explore this natural environment support both student learning and promote positive attitudes in relation to appreciation, responsibility and sustainability. ISZL has a long history as outstanding music school. Embedded into the school day students in Grades 2 to Grade 8 learn a musical instrument through small group ensemble teaching each week. In Grades 2 and 3 students begin their musical journey learning the recorder. From Grade 4 students can choose from a wide variety of instruments from the woodwind, brass and string families and may also choose vocal training. Such a broad instrumental music programme provides the opportunity for students to make music together in one of our large variety of ensembles, which rehearse each week. Music camps are held yearly at our Outdoor Education Centre in Wengen and seasonal concerts are a feature of our Arts calendar. The ISZL Zug Campus Choir and the Zug Voices Choir offer children with a passion for singing the opportunity to perform at school in concerts and assemblies. The choirs also perform in local events and the ISZL Zug Campus Choir tours to a destination in Europe bi-annually. The Arts teachers (Music, Drama and Visual Art) work with grade levels and connect authentically to the learning that is happening in the classroom. The Visual Arts and Performing Arts (Music, Movement and Drama) is integrated and taught in 6-week blocks across the year. Activities and projects may connect to the Units of Inquiry or may make connections with Maths, Language or other disciplines. Each classroom and outdoor area at ISZL is seen as an individual learning space, which celebrates and encourages learning and has the power to invite, inform and intrigue. In setting up and adapting learning spaces teachers and students are encouraged to think about about the following: belonging, cultural identity and needs, personal connections, ownership, multi-layered and accessible resources, sensory and kinesthetic opportunities, creativity, organisation, beauty and natural light. Learning spaces at ISZL make visible the essential elements of the of the PYP framework: skills, attitudes, concepts, knowledge and action. In the Primary School, children begin filtering into the school at around 8.30 and continue arriving over the next 20 minutes as children are dropped off by parents or arrive by school bus. Classrooms are open and teachers are waiting to welcome students to begin the day. Children engage in a variety of independent activities or socialise with friends until the teacher takes attendance to start the school day at 8.50. Children spend the majority of most school days in their homeroom classroom. At different times during the day the grade-level learning support and English as an Additional (EAL) teachers come in to team-teach with the homeroom teacher or work with smaller groups of children in the classroom. At times, other specialist teachers such as our Ed-Tech coaches, Librarians, Mathematics Coachor Arts Teachers may come to visit the classroom to provide support in their particular area of expertise. Classes also make a weekly visit to the Library where they can check out a range of engaging literature to read in class and at home. At times during the school day children move to other areas of the school to attend specialist lessons for Physical Education, Music or German. In Grades 4 and 5 students also attend weekly musical instrument lessons. Children enjoy multiple opportunities to play outside everyday and enjoy their lunches together in the school lunchroom. The time in the homeroom classroom revolves around a series of six engaging transdisciplinary units of inquiry. These units are transdisciplinary in that they incorporate elements of Literacy, Mathematics, Social Studies, Science, the Arts, and Physical, Social and Personal Education (PSPE), while focusing on a set of broad conceptual understandings. These units are used as a focus for developing knowledge, concepts, and skills, as well as positive attitudes and dispositions towards learning and growth. As half-past three approaches, children begin packing their bags to head home. Some children board the school buses, while others are picked up by their parents. Many children participate in our after-school activities programme and head home closer to 17.00. Please contact our Admissions team at +41 41 768 29 42 or admissions@iszl.ch to learn more.